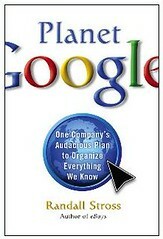 I finally got around to reading Planet Google: One Company’s Audacious Plan to Organize Everything We Know, by Randall Stross. It’s very well done. Stross is a frequently contributor to the New York Times and the author of several other interesting books on the technology industry. He knows how to weave a story together, and it helps that Google’s story is a pretty amazing one. Guided by its founding mission, to organize all the world’s information, Google has created storage capacity that allows it to gain control of what its users are you doing in a comprehensive way that no other company has done, and to preserve those records indefinitely, without the need to clear out old records to make way for new ones. Moreover, Google differentiates its service by refining its own proprietary software formula to mine and massage the data, technology that it zealously protects from the sight of rivals. This sets up a conflict between Google’s wish to operate a “black box” (completely opaque to the outside) and its users’ wish for transparency. Personally, I think most of these privacy fears are overblown. The mundane, trivial aspects of our daily lives aren’t really of much interest to Google. And to the extent users are concerned about their privacy, there are plenty of ways they can take steps to better protect their personal information or web-surfing habits. Blocking ads, rejecting cookies, and using encryption are three steps that privacy-sensitive users can take to better shield the personal info or surfing habits. Finally, the concern about government access to data is best remedied by limits on what government can access in the first place. We shouldn’t be regulating Google or other companies to limit information collection based on a fear of government access; we just need to tightly limit the government’s ability to enlist private companies as agents of the state. As a society, we had better get used to this because Street View is just the beginning of what will eventually grow into a far more sophisticated set of technologies as geo-mapping, geo-location, and image retrieval are married to virtual reality technologies. We’re really not that far away from Star Trek “holodecks” being projected into our living rooms, and once those holodecks let us walk down any street in the world, things are going to get both really exciting and a little bit creepy at the same time. But even if Google abandoned Street View tomorrow, somebody else would pick it up and run with it. Innovation in this space cannot be frozen. (Microsoft’s recent launch of Photosynth shows us that). Google has already taken steps to protect privacy on Street View by blurring facial images and letting users flag “inappropriate or sensitive imagery for blurring or removal.” That’s about all we can ask for. No computer company has ever been able to enjoy pre-eminence that spans two successive technological eras. IBM in the mainframe era could not head off the ascent of Digital Equipment Corporation in the minicomputer era, which, in turn, could not head off the ascent of Microsoft in the personal computer era. And now Google has “succeeded in pushing Microsoft into a defensive crouch” and made life very difficult for that supposed “monopolist” of the PC era. As a result, some Google critics claim this latest King of the Tech Hill cannot be toppled and that Google is the new “monopoly” we need to worry about. But these fears are also overblown. Google faces threats today from many different providers and doesn’t really even have its act together in other areas. For example, Stross points out how Facebook and other social networking sites have been a real pain for Google. Facebook, in particular, is creating a massive walled garden that is largely outside Google’s search and information retrieval capabilities. “In a twinkling,” Stross argues, “Facebook became a miniature Web universe–behind a wall, inaccessible to Google.” (p. 30) Meanwhile, in recent months, Google has annouced layoffs and has scuttled a variety of programs and projects which haven’t panned out, including experiments in social networking, virtual worlds, and a Twitter competitor. But it is tomorrow’s providers and technologies that will pose the most serious challenge to Google’s current hegemony. No one can predict what big application(s) or competitor(s) will emerge next, but it all could happen faster than you think. After all, let’s not forget that most of us hadn’t even conducted our first Google search 10 years ago, and no one considered Google a serious threat to Microsoft back in 1999. Just a decade later, Google has Microsoft wondering if they have a future at all. Things can change that rapidly in the digital world and it should make us question the wisdom of government intervention into such a fast-moving field. Indeed, Google’s “Don’t Be Evil” motto is already wearing a little thin in some quarters. And some of us still aren’t even sure what it means. As Google grows bigger and makes buckets more money in coming years–and they likely will–I think Stross is correct in arguing that Google’s honeymoon with the public and policymakers will likely come to an end. That doesn’t mean they won’t still be a great company doing great things, it’s just that they’ll be antagonizing even more competitors, lawmakers, and other groups than they already do today. And that will likely spell serious trouble for them. It’s never good to have so many enemies. Just ask Microsoft! In the meantime, we shouldn’t lose sight of what an amazing capitalist success story Google has been and how lucky we are that they have been at least a little bit successful in their mission “to organize the world’s information and make it universally accessible and useful.” It’s an incredible story, and Planet Google is a fine early history of the company and the new era of computing it has ushered in.